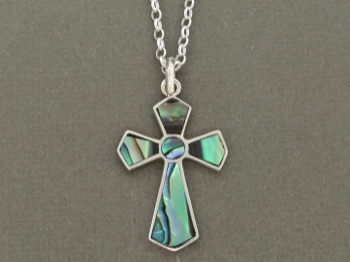 Abalone shell jewelry is loved for its variegated colors ranging from purple, to blue, to green, to brown, to ivory - always different, no two pieces are alike. Abalone are actually sea snails of varying sizes. The inner layer of their shell is composed of mother of pearl which is highly iridescent and prized for its changeable colors. 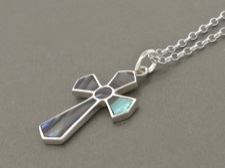 These shell pieces are inlaid in sterling silver and come complete with a sterling chain. 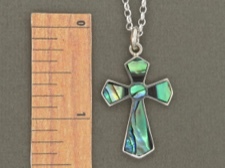 Please see below for a size reference and to choose a 16 or 18 inch chain.